Nashville-based country music stars pose in front of a Jones-Airways-owned Falcon 900 jet in Nashville before departing for a police benefit show in Fort Worth, Texas, in July. Jones Airways donated the jet, in support of the Dallas Police Association's Assist the Officer Foundation. In the days following the racially-motivated killing of five police officers in Dallas in early July, a slew of country music stars put on a benefit concert for law enforcement at the iconic Fort Worth honkeytonk Billy Bob's Texas. And a handful of the artists who performed at that show arrived in Dallas last month on a Falcon 900, tri-engine jet owned by Cleveland, Tenn.-based Jones Airways. The plane was lent for the cause free of charge by company officials and Jones Airways owner Allan Jones. "We're supporting police around the country, so it's something that we jumped on," Jones said last week. Jones Airways is a private charter flight business, which deals regularly with well-known clients, from national politicians to entertainers and business leaders. Jones Airways is based out of the Cleveland Regional Jetport. 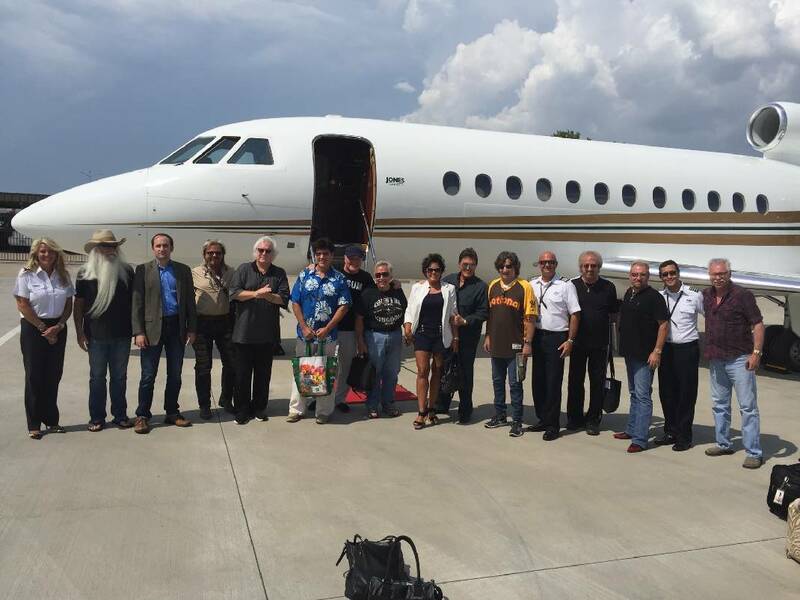 Being in the charter flight business, officials at Jones Airways were quick to learn of the benefit for police officers in Dallas, and of a search by Nashville-based country artists (like the Oak Ridge Boys) for a flight to the show. Jones Airways volunteered to send its jet from Cleveland to Nashville to pick up the artists, then carry them from Nashville to Dallas and back. The trip normally would cost around $18,000, said Jones. It cost Jones Airways upwards of $8,000 to send the Falcon to Fort Worth and back. Artists performing at the show at Billy Bob's Texas did so free of charge, with all proceeds (at $10-per-person general admission) going toward the Dallas Police Association's Assist the Officer Foundation. The foundation provides financial assistance to officers injured in the line of duty, and the families of officers killed in the line of duty. Along with the Oak Ridge Boys, John Conlee, Collin Raye, Ronnie McDowell, Kelly Lang, T.G. Sheppard and T. Graham Brown flew on Jones Airways' Falcon 900 jet. Jones, who made his fortune as owner of one of the largest privately-owned payday lending businesses, Check Into Cash, also has backed a number of education and sports programs in Tennessee. Six years ago, before Tennessee Promise gave in-state high school graduates a chance to attend two free years at a state community college, Cleveland's Jones — along with a handful of others around the state — committed themselves to funding community college tuition for local students. And last month, Jones cut his final check for the program — a $73,000 note — now that the state's Tennessee Promise program is in full swing. Jones was one of the first to commit to the program, called TN Achieves, which was created by then-Knoxville businessman Randy Boyd. Boyd is now commissioner of the state's Department of Economic and Community Development. Jones said last week he signed on with TN Achieves early because college debt is an enormous burden on students. "I believe the federal government is putting people in debt with these crazy amounts of student loans to them," he said. "You can't pay that back, and buy a house and a car starting out." The money wasn't a no-strings-attached, free and easy ride. Students accepting TN Achieves money had to meet regularly with college and success mentors. And the money paid whatever gap existed between students' financial aid and their final bill. Still, the costs billed to the Jones Foundation mounted, and increased year-over-year. "This is the first donation in my life that I had no idea where the zeroes would end," said Jones. "But now they have finally ended, thanks to Gov. Haslam and Tennessee Promise." At last count, Jones said his contributions to local students helped send 657 to Cleveland State Community College. The Jones Foundation paid around $839,500 into the program. Jones' father, Cleveland businessman W.A. Bill Jones, was instrumental in the mid-1960s in getting a state community college in Cleveland.